The arrow in the above photo points to an explosive “squib” that proves that there were pre-planted explosive devices used to sever the massive internal steel beams so that the doomed building will collapse down entirely into its own footprint, thereby minimizing the damage to adjacent buildings (the goal of every controlled demolition). 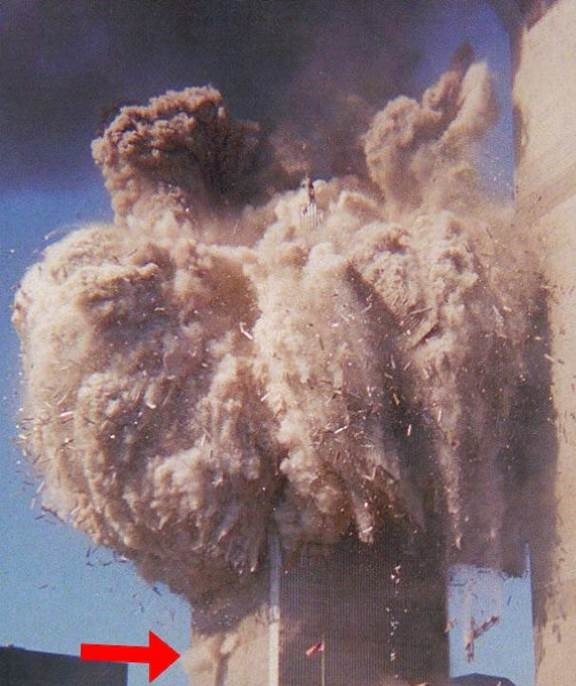 Note that chunks of the steel girders have been thrown upwards and outwards at high speeds due to the power of the explosive devices that had been planted in the buildings for weeks prior to the demolitions by unknown co-conspirators. Everything else was pulverized into fine dust. This week will mark the 14th anniversary of 9/11/01 and the beginning of America’s bankrupting endless war against any and all so-called foreign enemies that, in the opinion of the ruling elites, need to have their sovereign nations de-stabilized so that various economic and corporate predators can gain access to the resources of the region. Thousands of ethical, intelligent, scholarly, science-based, peace-loving, truth-seeking and once patriotic researchers (seeing through the absurd conclusions widely promulgated starting on 9/11/01) have endured far too many years of black-listings by those who really know better – namely our willfully ignorant (or frankly deceptive) ruling elites (of both political parties) and their co-opted co-conspirators in the mass media who have obediently enforced the black-listings. Those of us who consider ourselves honorable 9/11 Truth-seekers understand how Galileo Galilei felt when his scientifically provable truth (that the earth revolved around the sun) was brutally suppressed by the ruling clerical elites of the 16th century. Of course his run-in with church authorities was partly incited because he couldn’t refrain from pointing out that, because of his astronomical findings, he had proof that certain passages in the Bible couldn’t be true, thus claiming that the Bible was not inerrant. Cognitive dissonance erupted in the Vatican, and Galileo was declared a heretic and an enemy of the church. His books were banned, he was forbidden by the Inquisition to teach his “heresy” and he was placed under house arrest for the rest of his life. It took 4 centuries for the church to admit its error, thus inadvertently admitting that the Bible was not inerrant. The enforced silence by the mass media concerning the Crime and Cover-up of the Century (the events of 9/11/01) should have been over long ago, that is, if there was any justice in this nation. Is Courageous Investigative Journalism Dead? If real investigative journalism was still alive and kicking in our corporatized, for profit media environment, and if exposing Big Lies was still regarded as important in our dying democracy, the black-listing of 9/11 truth-seekers and the court of law-worthy evidence that they have collected would have been celebrated and not denigrated. But the absurd official, media-blessed version of what happened on 9/11/01 has been proven to be totally false and the consequences of the failure of our (mis-)leaders to admit that they have been bamboozled by the Big Lie have been devastating to the world. The consequences of the illegal and fraudulent invasion of Afghanistan and Iraq, orchestrated under the guise of several Big Lies by the Cheney/Bush administration are still being played out in the millions of war refugees in the region that are desperately trying to leave the war-torn nations that the Pentagon helped to destabilize. 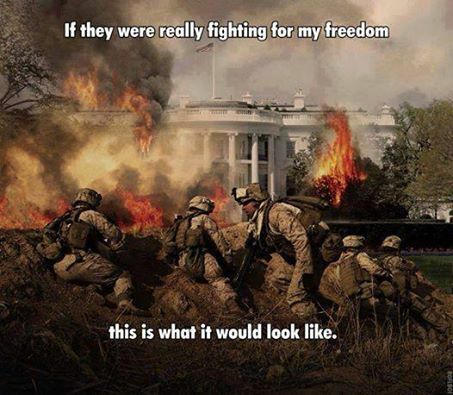 The endless wars that began in earnest after 9/11, and the constitution-shredding Patriot Acts and Homeland Security Act, had all been planned long before the three towers came down, and the recurring wars of retaliation (“Saddam tried to kill my daddy” – G. W. Bush) and resource theft (OIL = Operation Iraq Liberation) had likewise been planned ahead of time. Critics of American imperialism totally understand that “Great Satans” make good use of “Big Lies”. 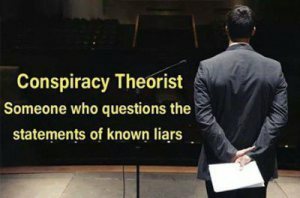 The millions of whistle-blowers among us who have done the deep thinking, the heavy work and the research into what REALLY happened on 9/11 (and why) have become disillusioned with many previously respected politicians (of both political parties) who have run away from the unwelcome truths about the Crime and Cover-u of the Century. I have long wondered what could be wrong with those that accuse me and my 9/11 Truth-seeking colleagues of being lunatic, low-life “conspiracy theorists”.